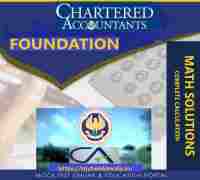 The Institute of Chartered Accountants of India (ICAI) launched it’s new plan to make the entry-level in the form of CA Foundation. Apply and fill Form Online Through the ICAI portal. Syllabus Paper 1: Principles and Practice of Accounting. Paper 2: Business Laws & Business Correspondence and Reporting. Paper 3: Business Mathematics and Logical Reasoning &Statistics. Subjective Papers Paper 1: Principles and Practice of Accounting. Multiple Objective Questions based Papers Paper 3: Business Mathematics and Logical Reasoning &Statistics. To develop an understanding of the basic concepts and principles of Accounting and acquire the ability to apply the same in preparing financial statements, computing accounting ratios and simple problem solving. Indian Accounting Standards – Concepts and Objectives . Elements of financial statements, Closing Adjustment Entries, Trading Account , Profit and Loss Account and Balance Sheet of Manufacturing and Non-manufacturing entities.